Whether you’re looking for a baseball glove, a pair of soccer cleats, or a basketball, the great locally-owned sporting goods stores of New Jersey stock all of that and more. It doesn’t matter if you’re just starting out in your sport or you’re a seasoned vet, there’s something for everyone. At these shops, you’ll find a highly-knowledgeable staff with a passion for sports that matches yours. Here are the 10 best in the state. Dover Sport Center features an excellent selection of sporting goods including wrestling, fishing, hiking, camping, team sports, snow sports, and even hunting gear—basically they’ve got you covered for any sport you practice professionally or as a hobby. The helpful staff can help you find exactly what you need, and feel free to call ahead if you have specific inquiries. Birkenmeir Sport Shop opened in 1982 as a small soccer gear store, but due to its popularity, it has since expanded to a sports store specialized in soccer gear and apparel from international brands. They carry numerous types of soccer shoes and uniforms. The owner of the store is a former professional soccer player for the Cosmos, so you can feel passion for soccer throughout the store and in the staff. The staff at Farrier Sporting Goods store have seen generations of children playing and excelling in sports throughout the seasons as they’ve been open since 1968. 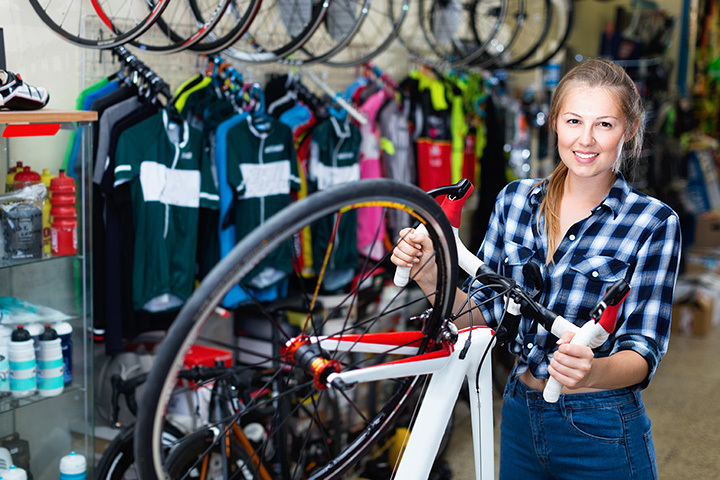 They carrier the same major brands that chain sporting goods stores also stock, yet the knowledgeable staff are able to apply their years of experience and individualized attention to help you find exactly what you need. And if they don’t have it in stock, they are happy to order if or you. In addition, Farrier Sporting Goods offers baseball glove re-lacing to get you ready for the next out. Offering both brick and mortar and online shopping, Thompson Sporting Goods has your convenience in mind. Their specialty is school-offered sports, like lacrosse, baseball, and volleyball, so kids can pick up the gear needed for after school sports or a lost jersey just in time for the next game. They also offer screen printing and embroidery on-site. Sports Expert is a family-owned and operated sporting goods store that stocks whatever you need for school or extra-curricular sports. They carry sneakers, cleats, and apparel for nine sports. In addition, they offer custom uniform, embroidery, and silk screening for custom jersey or sports apparel orders. Verona Sports Center has been serving the sporting goods needs of the community for nearly 50 years. The owner and the staff here carry all the gear needed for tots just starting out in little league to those earning their varsity jackets. Pick up anything from hockey sticks to baseball helmets, mouth guards, balls, and more here. For customization, they offer lettering and embroidery. This privately-owned sporting goods store stocks gear, uniforms, and varsity jackets. Shop online or in-store for track and field, football, soccer, baseball, and hockey gear and apparel. They also offer screen printing and embroidery for customizing uniforms or creating a new team look. Middlebury Sports & Apparel offers something a bit different—a buyers’ club that allows members to get discounted prices and access to the best sporting goods. This is appropriate for serious athletes who need to purchase near gear frequently and their staff can help you find exactly what it is that you need. They carry all the major brands, yet membership gets you special prices. The Sport Spot NJ has been focused on swim, snow, and tennis supplies since its opening in 1970. They stock skiing and snowboarding brands such as Atomic, Roxy, Full Tilt, Burton, and K2, so they’ll have you covered on the slopes. If cold weather sports aren’t your thing, they carry both competitive and leisurely swimwear, and offer a full-service tennis center that can fix rackets and more. Hooked On Soccer is one for serious soccer fans. They carry the jerseys and apparel of the Portuguese League and National Team as well as other European, North American, and South American teams. They also carry a selection footwear for adults and children.